SAN FRANCISCO – It was a day when the shift from the past to the future was almost palpable. It started Thursday morning in Berkeley where Green Wombat was moderating a panel of tech luminaries gathered at the University of California’s Global Technology Leaders Conference. As Shai Agassi, founder of electric car infrastructure company Better Place, makes the case for harnessing Silicon Valley’s technological innovation to Detroit’s manufacturing might to create a sustainable car industry, dispatches from the automotive apocalypse roll down my BlackBerry: Ford (F) shares sink to $1.01…GM’s (GM) stock falls to its lowest level since World War II…U.S. automakers beg for a bailout…California Congressman Henry Waxman ousts Michigan’s John Dingell — the Duke of Detroit — from his 28-year chairmanship of the powerful House Energy and Commerce Committee. Agassi slips out of the conference and an hour later I catch up with him across the Bay at San Francisco City Hall where he and representatives of Governor Arnold Schwarzenegger and the mayors of San Francisco, San Jose and Oakland announce a $1 billion project to build a regional network of electric car charging stations. Better Place has signed similar deals with governments in Israel, Denmark and Australia, but California is the company’s first foray into the U.S. market. Planning for the Bay Area network begins in 2009 with construction scheduled to start in 2010 and commercial rollout set for 2012. The mood is ebullient. “This is the start of a regional effort to become the capital of electric vehicles in the United States,” proclaims San Francisco Mayor Gavin Newsom before an audience that includes representatives from state and federal environmental agencies, green groups. Silicon Valley business leaders and officials from GM and Toyota (TM). The blueprint works like this: The mayors of the Bay Area’s three largest cities agreed to expedite permitting and installation of electric car charging stations, standardize regional regulations to promote an electric car infrastructure and offer incentives to employers to install chargers at workplaces. 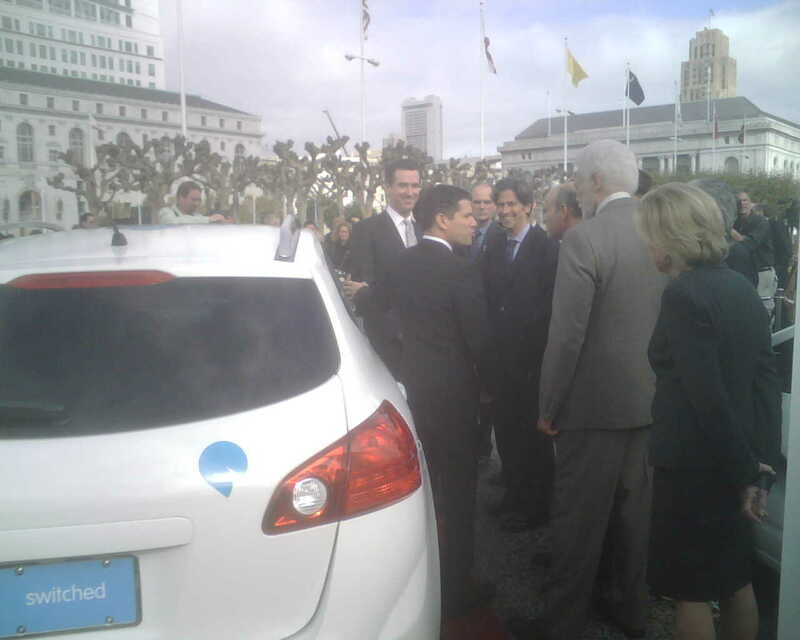 The mayors also agreed to pool purchases of municipal electric car fleets. Better Place will raise the capital to install thousands of charging spots on the streets of San Francisco, San Jose and Oakland as well as stations between California cities where drivers can swap depleted batteries for fresh ones when they make longer trips. The Palo Alto-based company will own the car batteries and charge drivers for the miles driven. Automaker Renault-Nissan is developing electric cars for the Better Place network. The big idea: Only by building an electric car infrastructure first will automakers produce the tens of millions of electric cars needed to make a significant dent in greenhouse gas emissions and the nation’s dependence on foreign oil. When Green Wombat sat down with Agassi and Newsom in the mayor’s offices Thursday afternoon, I asked Agassi, who brings a charismatic messianism to his mission, how Better Place would raise the billions needed to roll out an electric car infrastructure in California amid a global economic meltdown. He noted that in Australia Better Place signed up investment giant Macquarie Bank to create an infrastructure fund to finance that project while in Denmark a utility will provide financing. “We will do the same thing here; we’re working with Morgan Stanley (MS) and Goldman Sachs (GS),” Agassi says, recounting a conversation he recently had with investors who he said were eager to put money in Better Place projects. If anything, Newsom, 41, and Agassi, 40, and their allies regard the confluence of the financial crisis, the great Detroit car crash and the consolidation of green power in the incoming Obama administration and Congress as a once-in-a-lifetime opportunity to launch a disruptive technology on a global scale and transform the U.S. automotive industry. There’s no doubt that Newsom has a knack for game-changing politics. (He launched the gay marriage movement in these offices.) But the nuts and bolts of getting the bureaucracy to fall in line will be a harder challenge, as anyone who has ever tried to get a permit to do a home renovation in San Francisco can tell you. And not all of San Francisco’s collaborations with Silicon Valley tech companies have gone well — witness the collapse of the citywide Wi-Fi initiative Newsom undertook with Google (GOOG). On Thursday, Agassi and the politicians took pains to paint the Better Place initiative as not a California versus Michigan thing, or new economy versus old. And they just may be right. For in a strange way, by building an electric car infrastructure, California is offering Detroit a rescue package of its own: Supplying the network lays the groundwork for the mass production of electric cars that could be the auto industry’s salvation. While electric cars sound great, and it’s the drumbeat of the Global Warming Fearmongers, just where/how do you expect the electricity to come from? Solar? Wind? That won’t even make a dent in the total required need if you put millions of electric cars on the road. The next President wants to destroy the use of Coal to generate Electricty, how will he do that while at the same time you are expecting more electricty for electric cars. ya thats a lot cleaner. Now you have the electric companies burning millions of tons of dirty coal to produce the electricty for your electric cars.Brilliant. Where’s a good earthquake when you need one. Anyone who makes such a statement is clearly completely out of touch with reality himself! Great article. As the author points out, thus is a seminal moment in history, where the future — i.e. a better one — can be determined. The San Francisco Area initiated the environmental movement 30 years ago. Ditto for the personal computer and the Internet revolution (Silicon Valley is in SF Bay Area). Now there is another golden opportunity. Actually it has been going on for several years with solar, nano, and other technologies integrating and coming together fast (while others sleep). Will Detroit listen. They will probably have no choice. The winds of change blow from West to East in the US, only the media fails to perceive it. It’s called nuclear power with a mix of solar. Coal plants contribute to ~10,000 deaths per year in the U.S. due to particulate emissions and the asthmatic and other respiratory complications those particulates cause. Nuclear, meanwhile, has quietly been providing about 1/4 of our nations electrical power, and not one member of the public has ever been killed, and there has only been one emission (3 mile island). Unfounded fears of nuclear are in large part responsible for the global warming we face. Nuclear power + electrical cars = energy independence. Adding solar into the mix makes sense, but solar alone cannot provide enough energy. You don’t need to burn a lot of coal for electricity. The source of the electricity turns out not to matter as much as you may think. Electric motors are about three times as efficient as internal combustion engines; the combination of power plant, transmission lines, and electric car consume less total energy than it takes to push an internal combustion car the same distance. Makes you wonder why GM was so intent on killing their 1st-to-market electric car, besides being embroiled in killing the electric trolley controversy 50+ years ago (and fined a piddly amount). Is this karma finally smacking the dinosaur ? Why not integrate Wi-Fi hotspots into the charching posts ? Google and Better Place should cooperate here. It would be a win-win for them. To those posters questioning how the electricity will be generated…. natural gas will be used to replace coal until wind and solar ramp-up. Coal is only 2% of our electricity in California. 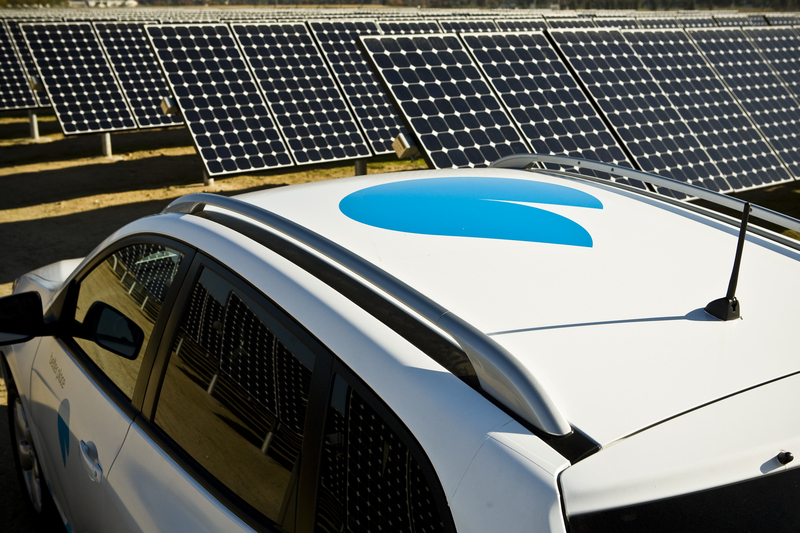 And if you want to run an ev on solar power thats 30% off now with the tax credit. Go Arnold, Go California, Go Better Place, get off your duff America and go too! The gas prices this past year have seriously damaged our economy and society. We must get on with becoming energy independent.We can’t take another year like this past. Jeff Wilson has a wonderful new book out about the energy crisis and what it would take for America to become energy independent. It covers every aspect of oil, what it’s uses are besides gasoline, our reserves, our depletion of it. Every type of alternative energy is covered and it’s potential to replace oil. He even has proposed legislative agenda’s that would be necessary to implement these changes along with time frames. This book is profoundly informative and our country needs to become more informed and move forward with becoming energy independent. It is called The Manhattan Project of 2009 Energy Independence NOW. I think if the auto companies would like to be bailed out, they should approach the oil companies who have raped the country over the past year with their prices. Let the oil companies use their outrageous profits to buy into those failing icons of gas powered machines! With Calfornia having the most fragile electric grid in the country the people will be using more electricity than can be produced currently within the state. And all the plug in electric vehicles will be charging during the daytime, which is also the peak time of electricity consumption. California better start building nuclear and natural gas power plants today to support the demand of these electric cars that will be in use 5 years from now. Most of you people are saying wind and solar are the answer to our energy independance, this is somewhat true but you fail to realize that large power plants are also needed to maintain stability of the voltage on the electrical grid. McCain was right on this part of the energy indepedence equation by stressing the need for nuclear power plants (also natural gas combined cycle power plants could also used). With 50 % of all electricity currently being generated from coal their will be a net increase of green house gases produced because the electric powered cars will be using power from coal fired power plants, wow that will accomplish a lot. I wish you Califorians luck with all your brownouts while your electric cars are charging and you don’t have enough power to get to your house at the end of the day. But if you are lucky, you’ll be able to catch that natural gas powered bus home(it is my belief, that we should switch our trucking fleet and buses to natural gas, of which there is plenty found here in the good ole US of A) . Somebody better get a clue on a sound energy policy soon, because if we leave it up to the government we are surely doomed. Hey Susan K. that’s so hypocritical probably 50 % of the electricity your state ends up buying is probably produced from coal. California has a mandate to produce 20 % of electricity from renewable sources by 2010 but from what I read they won’t make the 20 % level until 2013 or later, due to lower fuel prices and the current credit crisis causing utilities to cut back on Capex. Putting electric cars in service before the power plants are even licensed is simply moronic. It takes about 5 years to have a power plant in operation from the time the application for license is submitted (Its more than twice that long for a nuclear power plant). I would suggest that you don’t put the cart in front of the horse. on November 24, 2008 at 12:49 am | Reply Henry - Houston, Texas. What would we do with that kind of Car in Houston Texas? I was without electricity for 3 weeks after Ike ? A car is more than just going to work. We want trucks and suv’s down here because we often have to drive threw 4 feet of water. Seems to me that we have an abundant capacity for innovation. What we need are rules and incentives to harness it. When oil prices get painful, voila – SUV sales crash. When I go to kids soccer games, I see the others arrive, usually two to three people, in large SUVs. Not a couple of cars, most of the cars. These are not bad people, they look at their needs and weigh the costs and make choices. It is my hope that we now find our selves in a perfect storm of change – combining the new legislative and executive leadership, the need for significant infusion of capital and job creation programs to salvage our economy, the new awareness and affinity toward better environmental stewardship, and an emerging understanding of the consequences of dependence on foreign oil. “drumbeat of the Global Warming Fearmongers”… dear lord, haven’t you been reading the news?? A collaboration of the best meteorological, oceanographic, and climatological scientists from around the world (thousands in fact) have submitted peer-reviewed proofs before the U.N. Council that concur we are the cause of the change. People have made the claim “the planet was warming up anyway”. From what I’ve read, the climatological model showed that we should’ve actually been on a cool down! Even *IF* you are ecologically suicidal, how about thinking from the perspective that we’ve got about 8 more years of oil reserves before all licensed drilling sites are emptied? How about the fact that we’re currently putting out $400-$500 billion overseas for imported oil, and it’s expected to only go up? Going electric is a no-brainer, and the only people who will tell you otherwise are those poised to make money directly from other ‘alternative’ fuels. As to where the electricity will come from, adding renewables to the grid will handle the increase from electric cars as we convert to them, we can build more fission reactors in the short term (meanwhile the test fusion reactor in France is getting it’s legs under it). Don’t limit yourself to only thinking about cars. The world has decided it wants to get off fossil fuels, and that’s the way it is. People who drag their feet on the subject will be subjected to more and more ridecule as time marches on. It’s not just ‘hippy tree-huggers’ going on about getting off our oil depency anymore. In truth- the Space Age has just landed on terra firma. Detroit automakers can’t produce cars at a price to make them competitive or profitable. The wages necessary to make the cars profitable would make autoworkers poverty stricken like most of the service workers in San Francisco. In Frisco you are either wealthy or poor. Taxes have driven the middle class out of town. For those of you who don’t know. GM may kill the electric car because who would pay $40,000. for an auto that can go 40 miles and then needs 6 hrs to be recharged. Also, it has a small gasoline engine which would need to have its gas tank frequently–what to do with that waste? Technology not there yet or even soon. the poor are well represented in San Francisco – there is a least 5 per intersection…..
liberal means SMART MAIN STREET THINKING…we take care of our poor and yes there is whole lotta wealth here too — it that not the goal? Frank, you haven’t a clue. Now be a good little boi and Google, “GM Volt”. Now look at the specs. See how they contradict your simple-minded dittohead posting. Good boi. Now crawl back into your dittohead world and pull the walls in around you. Bark like a Republican! Arf! Arf! Dear Mark of Texas. It might help your cause (and the cause of the dittohead Republicans everywhere) if some of you could spell. Point of fact, you spelled electricity wrong. Twice. Now, old son, if you aren’t literate enough to be able to spell what you are talking about, how can we take you seriously? Insofar as coal-fired plants are concerned, they are not just horible polluters, the damage the environment takes from strip mining and mountaintop removal is astounding. Coal power plants do need to be phased out, and I hope Barack makes a good start on that. Electric cars are more efficient, cleaner, quieter and should be more reliable. No more 3k mile oil changes. No more spark plugs. No crank angle sensors to go bad. No catalytic converters! Honestly, the biggest factor in changing how we live will be conservation. The American life-style is not a sustainable one. We consume a large chunk of the worlds energy. Now we have a country of 1.8 Billion in China, and 1.6 Billion in India who want the same life-style. All of us must find ways to conserve in addition to rational and realistic ways of generating the energy needed to power the world. But as a side note, I’m tired of people blaming Detroit for this mess. It’s funny that no one is complaining about all the Toyota Trucks and SUVs being produced. Meanwhile no one talks about the Ford Focus and Fusion, and Chevy Aveo and Malibu, all are small cars that get as good or better MPG than Japanese competitors. And yet in the bay area where I live, any rich community is overflowing with Mercedes, BMW, and Bentley. The car companies will make what sells period. The environment is everyone’s responsiblity, not Ford, GM, and Chrystlers’ alone. Not all fossil fuels are equally bad. If you discount the use of natural gas are part of the solution you are just not being sensible. Natural gas in a much cleamer fuel than other fossil fuels. natural gas is abundant in the United States and therefore can quickly reduce our reliance on foreign fossil fuel. Our trucking fleets and railroads should work on tranferring their fuels to natural gas. This would be good for 2 reasons, less pollution and less reliance on foreign oil. Besides battery powered trucks just won’t work! Its probably time to get on the natural gas bandwagon as part of our energy indepedence. I was wondering where you get your facts? Electric power is generally cheaper during the night because the the higher priced fuel power plants are cycled off line during that period leaving the base loaded and cheaper poer plants running (i.e. coal & nuclear). If electrical power increases during the nightime, then the higher priced fueled power plants will have to operate. Please don’t take one fact and try to extrapolate the world from it, you’ll probably end up with some very wrong assumptions, And we all know what happens when one assumes. We must move to 100% Renewables. Yes, that means we will NOT Burn Coal. This is a reality. This is inevitable. There is nothing that anyone can do now to prevent this from happening. Yes, all of this electricity will come from Solar and other sources. Lets just give up, American ingenuity is dead. Coal will never be part of our energy solution. Why don’t we just give all our country’s wealth away, eat raw meat and live in a dark cave. Most of the suggestions here are by people who don’t even have a clue about electicity therefore they don’t even understand how ignorant they appear. Do they serve fries with that raw meat? And how many bathrooms are in this cave? Well, this confirms what we all suspected, that Morgan Stanley’s and Goldman Sach’s funds have gone to a Better Place. (Sorry, couldn’t resist.) But, count me in. Tesla Motors right now is our last best hope for the American auto industry.